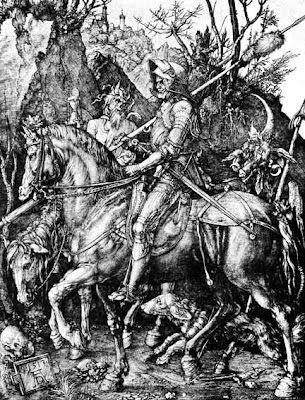 Albrecht Dürer, "Der Reuther" ("Ritter, Tod und Teufel", "Knight, Death and the Devil"), cupper engraving 1513. Today it is 10 years since Ernst Jünger passed away, almost 103 years old. The oldest WW1-veteran is the former British RNAS (later RAF) pilot Henry Allingham, born 6 June 1896. 111 years old [Added 3rd July 2008: Now 112 years old. ], he is the oldest man in Europe. Yakup Satar is an almost 110 year old veteran from Turkey. Satar, born 11 March 1898, enlisted in the Ottoman Army 1915 and was taken prisoner by the British in the Baghdad campaign 1917 [Added 7th April 2008: Yakup Satar has passed away.]. The Italian veterans Delfino Borroni [Added 29th October: Delfino Borroni has died at the age of 110] and Francesco Domenico Chiarello are both 109 years old (born 1918, 23 August and 5 November respectively) [Added 3rd July 2008: Francesco Domenico Chiarello has died at the age of 109.]. Harry Patch, born 17 June 1898, is at an age of 109 the last living British soldier who fought in the trenches [Added 3rd July 2008: Harry Patch is now 110 years old.]. The oldest Australian veteran is John Campbell Ross, 108 [Added 3rd July 2008: Now 109 years old.] years old. The last US Army veteran to serve overseas is Frank Woodruff Buckles, 107 years old. Stanisław Wycech (Poland) died 12 January 2008, at age 105. At the time of his death, Wycech was the youngest living WW1 veteran whose service had been verified.